I must be losing all sense of right and wrong. So, a law enforcment officer, while partying after the confrences normal hours, is considered "on duty" and because he is drunk, while on duty, kills himself and workers comp has to pay death benifits. This is the most ridiculous thing I have heard in a long time. This is so stupid it leaves me speechless. 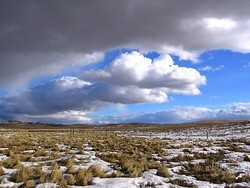 Billowing white clouds floating over the sparse Montana winter landscape. Taken 1/19/2006.